BWC provides metered water service to 800 homes. 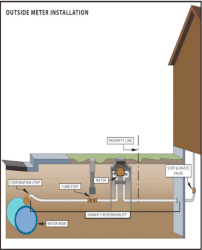 Calvert County Plumbing Code requires homes to have a thermal expansion tank on their water heater. With the advent of meter pits which contain back-flow prevention these devices become even more important. If you do not have an expansion tank, please contact your local plumber to have one installed.